The 231 St station on the (1) in the Bronx was recently rehabbed. All new station house, elevators, and paint. 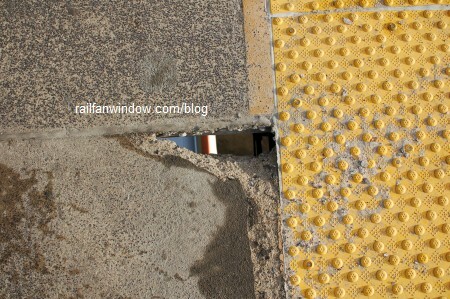 But the concrete platforms were only patched – they were not completely replaced. When the station reopened, you could clearly see all the patches along the platforms. Since then, besides getting hit by a couple trucks, the station seems to have been faring pretty well. However, last week I noticed a some wood nailed to a spot on the platform. I assumed it was a developing crack that would be addressed soon. It hasn’t been yet, but that’s not why I’m writing this post. This morning, a few feet past the wooden band-aid, I saw a small hole in the platform that you can see straight through down to the street. It appears that the hole formed within one of the “patch job” areas from the rehab, but I could be wrong. I’m not qualified at the moment to make a judgment on this, but maybe the entire concrete platforms should have been replaced during the rehab, and not just patched? It’s only been a couple years since the rehab… We’ll see if the platforms continue to deteriorate. This entry was posted on Thursday, February 12th, 2009 at 7:12 pm	and is filed under safety, subway. You can follow any responses to this entry through the RSS 2.0 feed. You can leave a response, or trackback from your own site.